In 1975, Dr. Antonio Laperal Tamayo, his wife Dr. Daisy Moran Tamayo and their friend Ernesto Palanca Crisostomo started the Perpetual Help College of Rizal at the Las Pinas City. 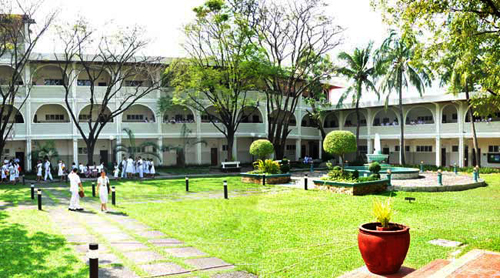 This is now known as the University of Perpetual Help System DALTA, Las Pinas. The first building of the university was meant to only house the College of Nursing. The institute received a ‘University’ status in the year 1997 from the Commission on Higher Education. The university is based on the belief that national development is directly linked with the kind of education that the citizens receive and hence imparts knowledge with the motto ‘Character Building is Nation Building’. The School of Medicine offers a four year long course on medicine which confers the degree of Doctor of Medicine. During the first year of their study, students learn about Human Anatomy, Physiology, Biochemistry, Preventive Medicine & Community health, Medical Practice I and Psychiatry. The second year deals with Microbiology, Pathology, Pharmacology, Parasitology, Community Health, Preventive Medicine, Psychiatry II and Medical Economics. Introductory classes on clinical subjects are also offered in this year. During the third year of their studies, students get to learn about didactic lectures on common diseases which they witness in clinical practice along with other interesting or rare conditions. In their fourth year students mainly spend time for actual patient care with the JONELTA section of the University of Perpetual DALTA Medical Center working at the clinical laboratory. These sessions give students a good idea about bedside manners, management, diagnosis and this is complimented by group discussions too. Once these are accepted, the students will be sent a note of acceptance through mail and this is when they need to apply for a student visa at the Philippines embassy closest to their residence. The College of Dentistry offers a six year long program which confers the title of Doctor of Dental Medicine. Students go through two years of Pre-Dentistry which consists of general education and other subjects related to health. The next four years consist of proper Dentistry related syllabus. The university takes great care to ensure overall development of its students and thus, maintain student organisations, a performing arts group, sports and athletics facilities where faculty and staff members take part as well. There is also a University Guidance Centre for students to consult for any issues with self-direction. Location: Las Pinas campus is 13 kilometers from Manila Airport, 16.9 kms from Embassy of India in Manila and 18 kms from Makati – Business District. Area: The University has 9 campuses. Las Pinas campus is on four hectares with offices, lecture halls, anatomy dissection laboratory, animal research laboratory, library, hostel, canteens, play grounds and hospital located in campus. Lecture halls are equipped with the state-of-the-art facilities and are air-conditioned. Laboratories: There are modern laboratories with state of the art equipment, which assist students in clinical and practical orientation. Auditorium: There is a large modern auditorium for professional and entertainment activities for use of students. Library: There is a large well stocked library with medical books and journals. Canteen: Several Canteens & eateries are on campus and around campus. Indian food is available in some of the canteens. Sports and Athletics: The University is a member of National Collegiate Athletic Association (Philippines) since 1984. There is an athletics track, an indoor basketball court, lawn tennis, table tennis. Several games are played on campus. The University team participates in inter-University competitions.